Officer Joshua Kaczmarek (left) was presented with a letter of commendation by West Alexandria Police Chief Tony Gasper (right) during the council meeting on Monday, April 1. Kaczmarek was honored for his work in stopping a dangerous criminal in connection with a homicide case in Lansing, Michigan. 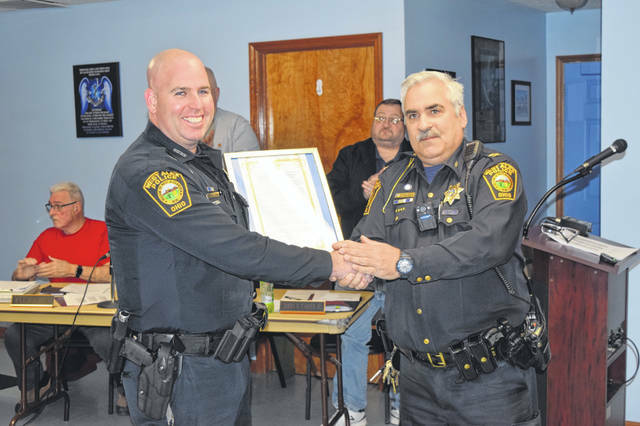 WEST ALEXANDRIA — Officer Joshua Kaczmarek was presented with a letter of commendation by West Alexandria Police Chief Tony Gasper during a village council meeting on Monday, April 1. Kaczmarek was honored for his work in stopping a dangerous criminal in connection with a homicide case in Lansing, Michigan. Chief Gasper explained, the village lost power back in January and he couldn’t say what happened at the time, but he is now at liberty to explain the situation. “Officer Kaczmarek was on a routine patrol when he observed a suspicious vehicle behind the LCNB Bank. Rather than driving on by, he decided to check it right away. The vehicle proceeded west in the alley behind the bank. He followed the vehicle and initiated his emergency equipment to do a traffic stop,” Gasper said. “However, the vehicle did not stop, it accelerated. The vehicle ended up heading south on State Route 503. Just outside the village limits on SR 503 South, Officer Kaczmarek made the determination that the vehicle was not going to stop. He was getting ready to radio Preble County Dispatch and advise them he was discontinuing to stop on the vehicle, when the vehicle crashed. “Assistance from the Fire Department, EMS, and Preble County Sheriff’s Department were dispatched to the scene. Power lines were laid down on or near the vehicle and after the lines were rendered safe, EMS treated both subjects for their injuries and they were transported to the hospital for further treatment. “During the incident, a firearm was located in the vehicle with a round in the chamber, ready to fire. Two other rounds were also found in the vehicle. While both a female juvenile and a male driver were being extricated from the vehicle, a registration check was done on the vehicle and it came back stolen through Michigan. “Detectives from Michigan were alerted and advised that the driver of the vehicle was a person of interest in connection with a homicide. After the driver was treated for his injuries and released, he was transported to the Preble County jail. Detectives from Michigan responded to the jail to speak with the suspect, who admitted to the murder of a female. “The female was shot execution style over drug money. Evidence recovered from the vehicle maybe key to the prosecution of this case by the agencies involved. This case may also lead to serious criminal charges on one of — if not the biggest — drug dealers in the Lansing, Michigan area. https://www.registerherald.com/wp-content/uploads/sites/41/2019/04/web1_Police1.jpgOfficer Joshua Kaczmarek (left) was presented with a letter of commendation by West Alexandria Police Chief Tony Gasper (right) during the council meeting on Monday, April 1. Kaczmarek was honored for his work in stopping a dangerous criminal in connection with a homicide case in Lansing, Michigan.